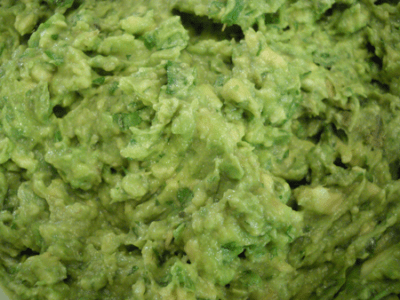 This is a super easy and simple way to make the very popular guacamole. This is a staple at our table whenever we are having any Mexican inspired dishes, or just for dipping. I have tried adding different things to my guacamole, but I always go back to this simple recipe. I really like to enjoy the flavors of the avocado, cilantro, and garlic. I think adding to much to guacamole is counter productive. It is perfect in its simplest form. It is also full of good fat, and also great to feed your little ones because of the large amount of good fats and nutritional value. My toddler loves it, he gets excited and puts down his spoon and just eats it by the handful. Very messy, but cute. Cut avocados in half and remove core. Scope out the flesh with a spoon and add to a bowl. Add fresh cilantro, garlic, and lime juice. Mix well with a fork, mashing the flesh of the avocado. Serve immediately.